Why bury a chest of books….? Here is a puzzle, circa 1400. Why would a usurped king’s half-brother bury a chest of books in the ground at the church in his Devon estate? The usurped king was Richard II, the half-brother John Holand, Earl of Huntingdon (had been Duke of Exeter), the Devon estate Dartington. This was just before Holand joined the Epiphany Rising against Richard’s murderer and usurper, Henry IV – a rebellion he, Holand, did not survive. The titles of the books are not known, but apparently the key to the chest is still in existence. The 15th century tower is all that remains of the church, which is adjacent to Dartington Hall, only a few steps from Holand’s private apartments in the main house. If anyone has any ideas – other than Holand’s desire to prevent the books from falling into other hands – please comment. It doesn’t seem that he buried other valuables at the same time, just the books. What happened to Coldharbour on Richard III’s death. . . .? Yes, another post about Coldharbour (above) which stood in Upper Thames Street, London. But this time it concerns an apparent omission in ownership. It is a known fact that after Bosworth, Henry VII turfed the College of Heralds out of Coldharbour and handed the property over to his mother, Margaret Beaufort. Isn’t it? I mean, there’s no doubt about this? Well, while following up another trail, I found myself in British History Online, specifically Old and New London: Volume 2. Pages 17-28, published originally by Cassell, Petter & Galpin, London, 1878. Even more specifically, the section deals with Upper Thames Street, and thus the mansion known as Coldharbour, which has strong connections with Richard III. The name of the house changed and was given different spellings over the years, but the house itself remained there at least from the time of Edward II until it was pulled down by the Earl of Shrewsbury who was guardian of Mary, Queen of Scots. Poor Cuthbert, he doesn’t look a happy man! But I digress. Ignoring the unworthy comment about Richard’s so-called ‘strong-handed usurpation’, there is, for Ricardians, a glaring omission in all this. What happened to Henry VII and Margaret Beaufort? The College of Heralds were turned out of Coldharbour before the Bishop of Durham ‘done the deed’ in the reign of Henry VIII. Yes? Any comments, ladies and gentlemen? Is it just an error by the author of Old and New London? An angelic Tudor mystery in Devon…. The great hall at Dartington Hall, near Totnes in Devon, is a magnificent example of 14th-century architecture, but there is a little oddity that not everyone will notice. It concerns the supporting figures on the corbels supporting the five-bay hammerbeam timber roof. The figures are angels holding the heraldic shields of the families that have owned the Hall. The lord who built the hall in the 14th century was John Holand, Earl of Huntingdon, Duke of Exeter. He was the younger of Richard II’s two half-brothers, and his angel is displayed on the left above. All the other angels (bar one), are the same, including those of Margaret Beaufort, who owned the Hall from 1487-1509, but is not thought to have ever visited it. The estate then reverted to the Crown. Sir Arthur Champernowne gained possession of Dartington Hall in 1554 (he exchanged other properties with Thomas Aylworth, Lord of Dartington) and his descendants owned the property until 1925, by which time it was derelict. The Champernownes were of Anglo-Norman descent, and influential, especially in the West Country. Now for the oddity. At some point, perhaps under the auspices of Sir Arthur, one of the angels in the great hall was altered. It is on the north side of the roof, and yes, like its fellows, it displays a coat-of-arms (that of the Champernownes) but the figure holding the shield is no longer an angel. Instead it has been changed into a Tudor serving man, with his wings severely chopped. (See illustration on above right.) Now, I am not the one claiming the figure is a Tudor servant, it is described as such by Anthony Emery, who has written a large work on Dartington Hall. Why has this angel been changed? Emery states that the Champernownes cut back this corbel, but gives no reason. Was it an attempt by Sir Arthur to show that he was a loyal servant of the Tudors? I cannot think of any other reason. Can you? In January 1400, after the failure of the Epiphany Rising that was intended to remove Henry IV from the throne and restore Richard II, John Holand, Earl of Huntingdon, the younger of Richard’s half-brothers, fled from London. The weather was foul, and time and again his vessel was driven ashore. Eventually he gave up, and took to the land again in Essex. To shorten the story, he was captured and summarily beheaded by his enemies at Pleshey. As I’ve said, Holand was Richard II’s half-brother, but he was also Henry IV’s brother-in-law. He chose to stand by his blood kinsman, and it cost him his life. Holand was not an angel, but he was a renowned tournament knight, a great showman in the lists, and always put on a star-quality performance. Other knights on the famous tournament ‘circuit’ knew he was a force to be reckoned with. He always delivered the goods as far as his audience was concerned, and must have been quite something to watch, so how very sad the shabby fate he was to meet that New Year in Essex. The thing is…what is the January weather like in Essex today? Well, Holand might have recognised it, what with high winds, floods, storm surge warnings and the like. It seems that all these centuries later, when it comes to weather, nothing much has changed in that neck of the woods. It was vulnerable then, and still is. The Holand Dukes rose against Richard III? Wrong!…. For those of you who do not know, I am very fond of Dartington Hall. I read all I can about it, and its history, originally because of an intention to write about its creator, the first Holand Duke of Exeter, but now because I just plain love the place as well. These Holand Dukes of Exeter – the first, John Holand, being the younger of Richard II’s two half-brothers through Joan of Kent – only survived for three generations, coming to an end in 1475 with the suspicious death of the third duke, the apparently unlovable Henry Holand. The duke in between, another John Holand, son of the first duke, was responsible for inventing the Duke of Exeter’s Daughter, a vile instrument of torture, a rack, which can still be seen at the Tower. Not a legacy to commend the second duke, methinks. I digress. Edward IV handed over Henry’ Holand’s estates to the wife from whom Holand was divorced, Edward’s eldest sister, Anne, Duchess of Exeter. Anne was by then married to Thomas St Leger, whose involvement in the Buckingham rebellion led to his execution by Richard III. This is as close as Henry Holand gets to rising against Richard III – through his ex-wife’s second husband! Huh? It can’t be a typo between II and III, because the Holands didn’t try to overthrow Richard II, on whose side they most definitely were, and anyway, Richard II was long gone by the time the third duke’s body washed up mysteriously on the shore at Dover. So I would like to know how Anthony Emery concludes that ‘they’ somehow rose against Richard III. They did rise against Henry IV at the end of 1399/ beginning of 1400 but came off worst – the first duke met a very sticky end at Pleshey Castle. And the third and last duke, Henry, was on the Lancastrian side at Towton, but accompanied Edward IV for the 1475 expedition to France. From which he failed to return, except as the body on the beach. 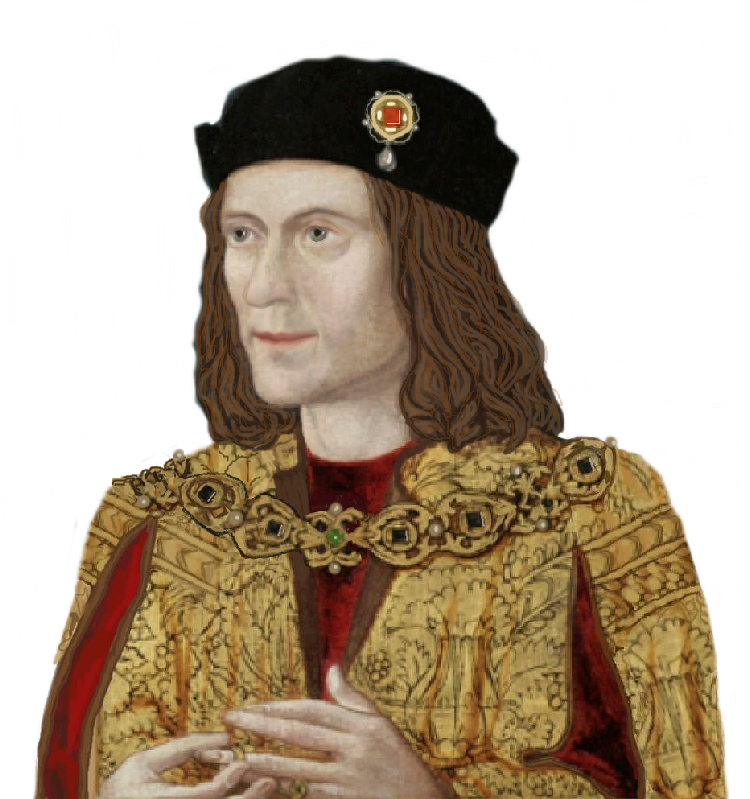 He died about eight years before Richard of Gloucester became Richard III. After Anne, Duchess of Exeter, Dartington fell to her daughter by St Leger, another Anne, who inherited Henry Holand’s estates through her mother. Well, it seems that when the duchess died in January 1476, St Leger did all he could – ‘by seditious means as it is notoriously known’- to get reversion of his late wife’s estates, including the Holand properties, and to secure them for the other Anne, his daughter by the duchess. Emery says it all fell through when St Leger paid the price for joining Buckingham against Richard. Presumably it all then went to the Crown, because from March 1487 to 1509, it was held by Margaret Beaufort – whose coat of arms is one of those supporting the rafters of the great hall. During the reign of Elizabeth I, Dartington was acquired by the Champernowne family, which held it for eleven generations, until in 1925 selling it to Leonard and Dorothy Elmhirst, who restored it lovingly to its present glory. So where does Emery gets his ‘fact’ about the Holands rising against Richard III? He also makes sweeping statements and claims concerning the first duke, whom he appears to loathe as much as some historians loathe Richard, but that’s another matter.